Many welding projects require a sturdy surface to work on, and that’s when a welding table can come in handy. It can help you get the job done safely and comfortably. When it comes to choosing a welding table, you have many options: different sizes, accessories and surfaces, as well as fixed versus portable tables. Which welding table is best for you? In this article, you’ll find more details about the various features to help you make an informed decision. What Is a Welding Table? 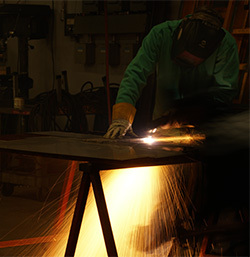 To prevent fire hazards, welding tables are made from steel as a rule. The surface they provide is helpful for both welding and metal fabrication. Why Use a Welding Table? Another benefit of a welding table is comfort. Most tables have adjustable legs, allowing a welder to sit or stand in an ergonomic position while working. What Makes a Good Welding Table? Comfort and sturdiness are the must-have qualities of a good welding table. Beyond these characteristics, the type of welding table that’s best for you can depend on your shop space, project and budget. Below are some of the main features to consider when selecting a welding table. How big is your typical project? That can help you determine what size welding table you need. If you need more space to work on big hunks of metal, opt for a table with a length and width of 4 feet or more. A large, modular table can be a good option if your project sizes tend to vary. Choose a table that is two to three feet in length and width for smaller workpieces. Some smaller tables are even designed to fold flat, a bonus for welders who are short on shop space. How will you keep your work from sliding around? A clamp. The good news is most welding tables come with the clamp built in already. You can also keep cables out of your way by securing them with the clamp. Some tables come with hooks on the side, which are great for keeping cables out of the way or holding the welding gun. If you have a large shop and plan on doing heavy-duty projects, you might want a large table with fixed legs. These tables usually can bear greater weights. Variations include modular options and those with wheels or casters. Welders with smaller shops or who ply their trade at multiple worksites may find a portable welding table more useful than a fixed one. The bases of these tables can fold up flat, making them easy to transport around. Many come with wheels so that welders don’t have to frequently fold and unfold them. One drawback to portable tables is that they usually can’t support as much weight as fixed ones. Two features that can be helpful are surface coating and slots. A zinc coating can prevent rust and hot debris from adhering to the table while still allowing it to conduct electricity. Slots and holes make it easier to clamp work because the welder isn’t limited to securing the work to the edges of the table. Making your own welding table is yet another option, and, of course, you can add all the bells and whistles mentioned above, if you want. You can read the full instructions on Lincoln Electric’s website. If you don’t have the time to build your own welding table or the budget for a new one, consider purchasing a used table. You can check the local classified section in your paper or one of the many secondhand selling websites. There are many considerations when choosing a welding table and, ultimately, the best one for you will depend on your project, workspace and budget. Students enrolled in welding training may want to take on the task of building their own table or quickly picking up a used one, while professional welders may require a new table with extra features. Either way, a welding table can be a helpful piece of equipment in most welding shops. A welding table is just one of the tools you’ll need in the welding industry. Find out what’s commonly found in a welding student’s toolbox.